The eviction of the partial occupation by three persons in the lower / mid range of the excavator is has proceeded quite far. One person is already in custody. The V-shaped steel tube, in which another person’s both hands are chained to each other, has already been cut open, presumably by grinding. 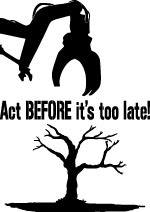 Thus, it is anticipated that the two other persons won’t remain on the excavator very much longer. The three other persons, who occupied the tip of the excavator at 70 meters height with climbing equipment, after all didn’t have any police contact. One embedded press person is also, after all, in place. The climbing unit of the police is on site and will probably sooner or later start preparing eviction. 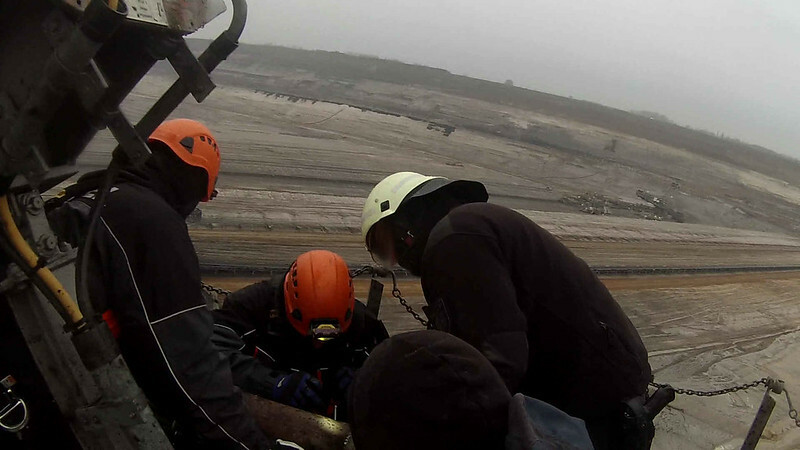 In the night from Saturday to Sunday at about 00:30 am, activists of the anti-coal-movement have occupied an excavator inside the opencast-mine Inden. One person is locked on, three others have climbed the digger with harnesses. 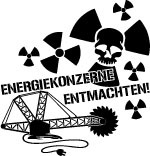 A banner reading “Lignite kills. Everywhere.” was dropped. The occupants have announced to block the work of the excavator for as long as the eviction by the police will take. The occupation is still ongoing. The (german) flyer for the Forest Festival is ready and lots of programme is fixed! 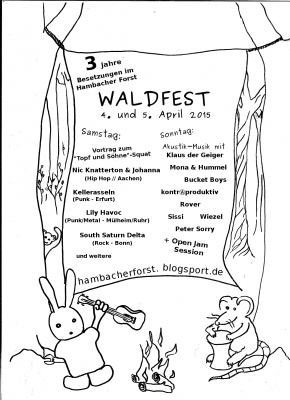 Come to the Forest Festival in the Hambach Forest! 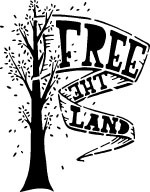 Spring is coming up and the Forest Occupation(s) celebrate their third birthday. So please feel invited to the Forest Festival at this occasion! On Saturday (4th April) members of the band “Kellerasseln” will read from their book “Topf & Söhne – Besetzung auf einem Täterort” (dt. “Topf & Sons – occupation in the perpetrator’s site”) (see below). Afterwards the Kellerasseln and other acts will play plugged livemusic. Then on Sunday (5th April) beginning at 2 pm we’ll have an unplugged acoustic concert with singers/songwriters ending with an open jam session, in which everyone will be invited to join in. Food and beverage are taken care for. Come to the forest, and dance into a new world! 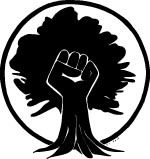 The occupations in and around the Hambach Forest are directed against the clearcut of the forest and the brown coal extraction causing it. On the March, 26th a lecture on the Hambach is going to take place in the quarter-centre ( = german Stadtteilzentrum) of Gasparlitsch in Stuttgart, located in south-west Germoney close to the French border. It’s scheduled to start at 19 pm. 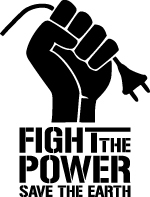 Topics are going to be the existing occupations as well as the emtore situation of lignite mining. Hopefully to see many of you there!